Even if you’re an urban gardener with little space, you can still benefit from growing a city vegetable garden. A window, balcony, patio, deck or roof receiving six or more hours of sun is all you need, in addition to a few containers. The urban gardener can enjoy a city vegetable garden in various ways. You can grow vegetables in containers, which can be transformed into thriving city gardens. These can be easily incorporated into existing patios or balconies, or grown in rooftop gardens. Growing vegetables is more versatile than one might think. Container-grown vegetables will produce an adequate supply of produce for the urban gardener while eliminating the hassle of large garden plots. Growing vegetables in containers is one of the easiest ways to create a city vegetable garden. With containers, you can grow anything from lettuce and tomatoes to beans and peppers. You can even grow potatoes and vine crops, such as cucumbers. As long as there is adequate drainage, nearly anything can be used to grow vegetables. Typically, smaller containers are used for more shallow-rooted crops like carrots, lettuce and radishes. Vegetables like tomatoes, potatoes and beans will benefit from using containers that are big enough to accommodate their larger root systems. In fact, the use of five-gallon buckets is not uncommon. To make use of all available space, consider growing vegetable plants in hanging baskets too. In order to help improve drainage and airflow, it may be a good idea to raise your containers about an inch or two off the ground with blocks. Place vegetables in a sunny area that is well protected from wind, which can dry out plants. However, container plants usually require more watering to prevent them from drying out. Balcony or rooftop gardening is an excellent way for city dwellers to enjoy growing vegetables. These city gardens can fit any lifestyle. 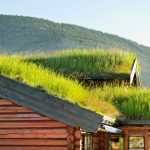 Rooftop gardens make use of space that might otherwise remain unused. 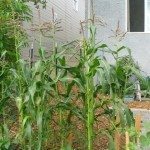 This type of urban vegetable garden is energy efficient and easy to care for once established, requiring only occasional weeding and watering. In addition, city vegetable gardening on rooftops can absorb rainfall, which reduces runoff. If weight issues for roofs or balconies are a factor, choose lightweight containers. 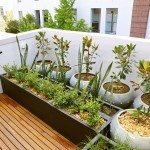 Container-grown balcony or rooftop gardens are extremely versatile, being easily moved around as needed, especially during winter or bad weather. City vegetable gardening is not that different from gardening anywhere else. Urban gardeners must take advantage of all available space. One great way to accomplish this is by growing a vertical city vegetable garden. This type of garden yields the same amount of produce without taking up space, and it’s also easy to do. You can create one of these gardens using shelves, hanging baskets or trellises. Since most vegetables can be easily grown in containers, shelves allow you the benefit of growing different types of vegetables on each shelf. You can even position containers so that all plants receive enough sunlight. In addition, slatted shelving will allow for better drainage and air circulation. Alternatively, vegetables can be grown in hanging baskets or on trellises. Hanging baskets can be placed wherever space allows and accommodate many types of vegetables, especially vining or trailing varieties. A trellis can be used for the support of these types of plants too, such as beans and tomatoes.